Instructions on how to change laptop settings have been attached below for PC and MAC. If you did not change your settings at school please follow the documentation and change your settings before coming to school tomorrow. go.det.win is a website created to authenticate your internet access. You will need to go to this website to login every day. What are these new changes? Our school was nominated to take part in the Secure Internet @ Edge program. The first high school in the state to have this new network in place. The benefits include an increase in speed - typical high school speeds are at 50mb/s but Cronulla High School now has 140mb/s speeds. Like all new systems there will be ups and downs but we hope these issues will be ironed out soon. Currently all intranet traffic will continue to route via the Data Centre, while internet traffic will go directly to the internet via the Teltra Internet Direct(TID). Dual Connectivity which in turn means increased bandwidth (WAN and TID). Currently, for example, if the school has a 100Mbp WAN link, the link is divided roughly by 80% internet content (YouTube, G suite, Twitter) and 20% corporate content (SAP, EBS, ERN). The new solution will deliver 100Mbp WAN link for internet content and 100Mbp TID link for corporate content. Improved Performance: Ensures the highest possible level of performance for critical applications by placing right flows on right transport. 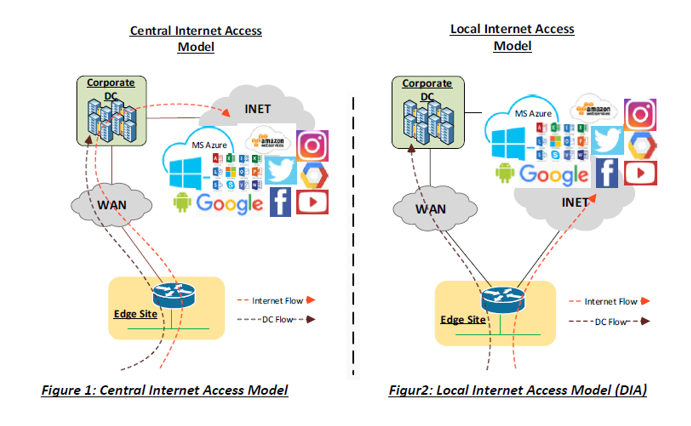 Provides optimized access to Internet resources and Cloud based services by leveraging the local internet connection.